When visiting Hecla Village along the shores of Lake Winnipeg in Manitoba, Canada, take the self guided trails to explore the history of the island. 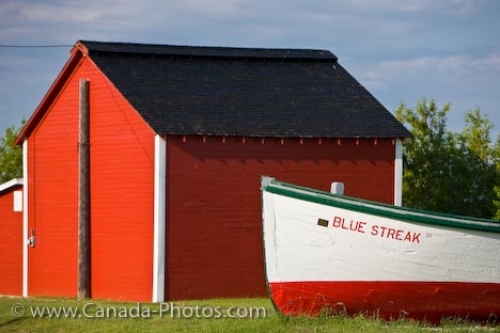 Here an old shed which has been restored and newly painted sits beside a historic fishing boat named the "Blue Streak". The fishing boat was used when commercial fishing on Lake Winnipeg was pioneered by the Icelandic fishermen. As more fishermen came to Lake Winnipeg, the various types of fish became depleted and between 1970 and 1972, the lake was closed to fishing as mercury polluted the waters. Many people rethought their lives and retired from their fishing career for good. Six of the buildings in the historic village have been restored and tourists should ensure they see this attraction while visiting Hecla Island. The entire self-guided walk is about 1 kilometer in length where the history of the Hecla Island settlement is told. Picture of the sheds and boat in Hecla Village located on the shores of Lake Winnipeg in Manitoba, Canada. Old Boat and red shed in Hecla Village on the shores of Lake Winnipeg, Hecla Island, Manitoba, Canada.